Kate Minogue as Tall’n’Soft Tallulah! I write this article still fired up with enthusiasm after completing the two-part training programme on teaching the AT in schools and colleges. The programme was devised by Judith Kleinman and Sue Merry. Judith teaches at the Royal College of Music and the Junior Academy of Music. She co-ordinates the STAT Education Special Interest group and is working and collaborating on taking Alexander work into secondary schools. Sue has been finding unique ways of working with primary school children since 1994 and is a founder member of Educare Small School where AT is integrated into the school day. The course was open to teachers, as well as ninth-term students, and previous experience of working with children and young adults was not required. Participants came from around the UK as well as the USA, Denmark, Austria, and France. During the first weekend (October 2016) we looked at how to structure a preliminary INSET day for teachers as well as the initial session with the pupils that we hope might follow from such an INSET day. We took a brief look at school and national curricula, examining how we could link an AT programme to them. It seems clear that AT is uniquely appropriate to helping pupils learn to master fundamental movement skills and to understand that mind and body are connected. Such skills permit children to read their environment and make appropriate decisions, allowing them to move confidently and with control in a wide range of physical activity situations. We were given lots of tips for managing children up to young adults and role-played doing hands on work with them. We also received an excellent ten-week outline programme on working with young actors from Penny O’Connor. Polly Waterfield, who teaches at Uppingham School, came in for the first day and inspired us by the way she establishes good working relationships with her secondary students. By playing ‘(don’t) catch the frog’ we saw how this simple game encapsulates basic principles of the AT while at the same time offering opportunities for dialogue and observation. Students are encouraged to keep an AT diary and Constructive Rest is promoted by setting up a ‘Constructive Rest Challenge’! Polly brought in displays of students’ thoughts on various topics including their experience of Inhibition and Direction. She told us that many pupils value their AT lessons as being safe spaces in which there is no requirement to try harder and achieve more and where one can learn from mistakes. If we feel safe, we can contemplate doing something new or unknown. Esther Miltiadous told us about her work at Educare, emphasizing the importance of stories and games, and giving us a set of ideas for games for young children. Typically the AT teacher will work with one child while the rest of the group is occupied with other activities. It’s important to give children choices, offering them the chance to change for themselves. For example, to a child sitting with feet wrapped around the chair legs she might say ‘Have your feet gone on holiday?’ and most likely the child will decide to place them on the floor and get better support. Each day Sue took us through the Educare Movement Circle. This brings the children together in a calm but energised way and focuses and centres them. It also introduces Body Mapping. Over the years she has experimented with language appropriate to young children, referring to ‘floaty balloon head’ and ‘runny custard shoulders’, and obviously this can be adapted to suit the participants. We had great fun coming up with original or adapted stories for children that we then performed. (I have to admit this was my favourite part of both weekends!) For example, my group acted out the story of the Three Little Pigs (Nervous Nigel, Slouchy Sophie, and Tall’n’Soft Tallulah) and how they came up against Arrogant Archie the Wolf. We had great fun experiencing new versions of the Wizard of Oz, Hansel and Gretel, Red Riding Hood, Jack and the Beanstalk, and the original story of the King and the Bunny. Sue emphasised that young children have natural good use and therefore the teacher’s hands should be used sparingly. Stick to head, shoulders, and feet. During Quiet Time (Constructive Rest), some of them can learn to be helpers; this often works well with disruptive or fidgety pupils. The problem of unsuitable school furniture was discussed; it’s generally chosen according to its cost and stackability. Whether or not it is good for children to use comes low on the list of considerations. Any teacher who is unconvinced of the strain caused by sitting on a too-big chair should try working while perched on a high table with no foot support! Teenagers love to use games and props, e.g. balls and balance boards. They learn the importance of lunge and monkey through playing catch and experimenting with movement. These are examples of how they can connect with their bodies, nurture their sensory awareness, and understand that choices are always available to them. They may need to pay attention to how they go into and out of Constructive Rest and it may not have occurred to them that they are still moving during Constructive Rest because breathing is movement! Most of us managed to make it back for the second weekend (February 2017). Monika Gross was home in the States but participated via Zoom and was included in all pair and group work! Sue taught the Educare movement circle to us and we experienced Educare Quiet Time as though we were young children. We were enjoying that very much, but she apologetically got us up from the floor so that we could practise devising games to explore AT principles. Then there was more role-playing as we used writing implements at a desk. I discovered that labyrinths are not the same as mazes and that drawing lazy eights is extremely soothing. With Judith we discussed how to introduce Body Mapping to teenagers in fun ways. They are mostly uninterested in AT, but they ARE interested in themselves and so we explored the relevance of our work on thinking, impulse control, attitude, and the approach to life of younger people, helping them make AT work their own. Our attention was drawn to some differences between types of student. For example, dance and drama students are used to physical contact at college whereas music students are not. For us as teachers to remain safe, it is advisable to touch only joints, not soft body parts. However, some experience of hands-on work is important for teenagers to help them remember their bodies are a part of themselves and not something separate. Secondary students and older may be interested in doing their own filming and photos if there is a class tablet, for example. Obviously this is something that needs to be checked out with the school/college, but it offers many learning points for those behind, as well as in front of, the camera, e.g. how is the camera operator holding the equipment, breathing, and standing? There are many challenges to teaching AT in schools, not least in mastering the language of schools. However I now feel much more confident about taking the AT into schools because I have lots of resources, as well as the FB group, for support. It would be so wonderful if we could help children grow up into freely-moving and well-balanced adults who avoid developing the aches and pains that are so common nowadays. It would also be very helpful to the future of the Alexander Technique if there were more young people around who have experienced the Technique and therefore understand, thanks to its relevance to modern-day life, the benefits of applying it to everything they do. Let us hope that more and more of us will get the chance to work in schools and colleges in the future. 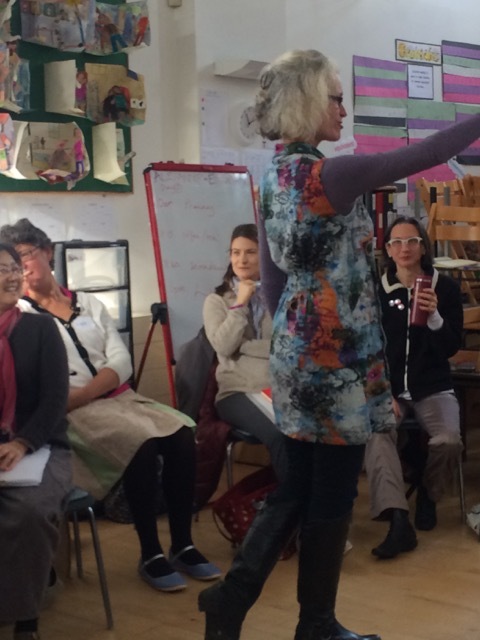 The aim of the DevelopingSelf Education Training Course is to “equip you with the necessary skills to go into schools and colleges to teach the Alexander Technique”.Over two weekends in November 2017 and February 2018 a group of Alexander Technique (AT) teachers and 9th term trainees were not only given the skills to facilitate this by Judith Kleinman and Sue Merry, but they also introduced us to an expanding and supportive network that is recognising the importance of our work globally across all areas and ages of education. 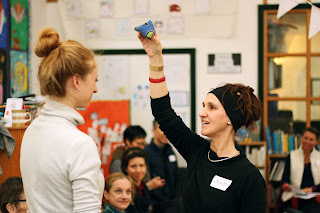 Both these pedagogs have an abundance of experience working with the AT in this field - their experiential style was enormous fun and provided the catalyst for everyone to feel confident taking the ideas and making them their own. Sue Merry MSTAT is generally recognised as a pioneer and world expert on teaching the Alexander Technique to children aged 3-11 in a school environment. Sue began her ground-breaking work with children in 1994 in a local primary school where she began to devise unique ways of teaching that aimed to integrate the work into the regular school day. In 1997 she was a founder member of Educare Small School in Kingston upon Thames, UK. At Educare she evolved ways of integrating Alexander work seamlessly into the school day. This enables regular teaching staff to carry on the work whether or not an Alexander teacher is present. She took some elements from other, complementary disciplines, and used them to help to teach and reinforce the Alexander principles. The aim being to make the learning accessible and, above all, fun.Sue still occasionally teaches at Educare but mostly now focuses her attention on training and helping other Alexander Teachers to carry on with this work, both at Educare and beyond, and on documenting and promoting the work of this unique school for future generations.Sue also teaches riders and horses.